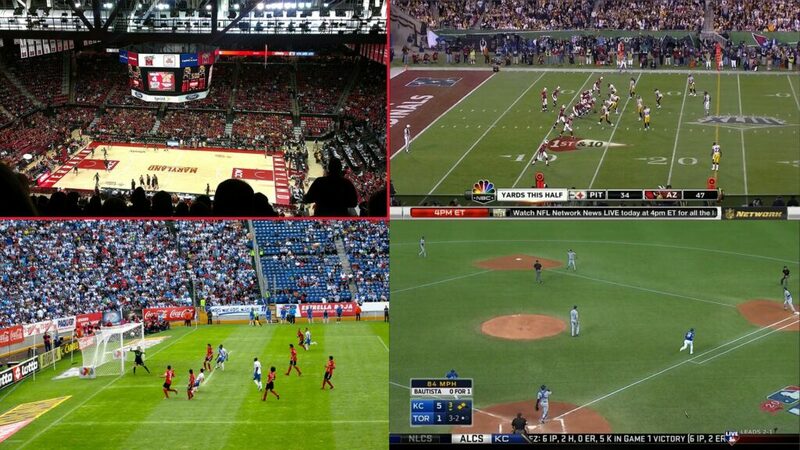 In my house we watch a lot of sports. My husband is always trying to find ways to see all the games at once. God Forbid if he has to miss one game it is a huge deal. He usually has two TV’s turned on and is switching one back and forth. Now Dish just launched the Sports Bar Mode for the Hopper 3. Super Cool Right? Just in time for the March NCAA Tournament games. DISH Network L.L.C. today launched Sports Bar Mode, also known as MultiView, to Hopper 3 customers nationwide ahead of NCAA tournament first-round games. Sports Bar Mode is a multi-channel view that divides a 4K or HDTV screen into quadrants, each with the ability to display a different program. The feature works by decoding any four different feeds and displaying them simultaneously. Sports Bar Mode works with all live, linear channels in DISH’s programming lineup, as well as on demand content, and recorded TV shows and movies. To access the feature, customers press the “Options” button on the remote control, select “Picture In Picture,” then “MultiView.” Once the TV screen is divided into quadrants, customers can easily toggle among the four channels to determine which one will have its audio played. Sports Bar Mode is compatible with both 4K and HD televisions when connected to a Hopper 3. On 4K TVs, the four quadrants display in 1080; on HDTVs, the four quadrants display in 540. Designed to change the way consumers find, record, stream and watch content, DISH’s Hopper 3 was first announced at the 2016 CES, then made available to the general market on Jan. 31. The third generation of DISH’s whole-home DVR system, Hopper 3 features 16 tuners, delivers an enhanced 4K experience, supports up to seven TVs simultaneously and integrates Netflix titles into universal search results. DISH Network Corp. (NASDAQ:DISH), through its subsidiaries, provides approximately 13.897 million pay-TV subscribers, as of Dec. 31, 2015, with the highest-quality programming and technology with the most choices at the best value. DISH offers a high definition line-up with more than 200 national HD channels, the most international channels, and award-winning HD and DVR technology. DISH Network Corporation is a Fortune 250 company. Visit www.dish.com. ← Previous Post Brand New Trailer and Poster for Marvel’s CAPTAIN AMERICA: CIVIL WAR!